After playing college football at the Colorado State University, Less Browne signed as a free agent with the Hamilton Tiger-Cats in 1984. Browne spent five stellar seasons with the Tiger-Cats, twice being named All-Eastern and All-Canadian. In 1989, Browne joined the Winnipeg Blue Bombers continuing his incredible playing career. In 1990, Browne set a league record for most interception return yards with 273 yards. A record he still held at the time of his induction. To this day, Browne still holds Pro Football records for most interceptions all-time with 87 and most interception return yards all-time during the regular season with 1,508. 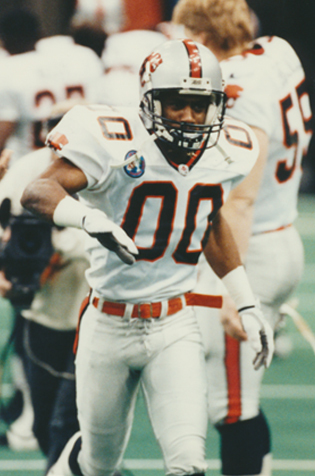 He also holds team records for most interceptions in a season with the Blue Bombers with 14, the Ottawa Rough Riders with 11, and the BC Lions with 11.